It took me a little while to realize that this album had actually been released on vinyl, but I couldn't begin to tell you how thrilled I was to discover that it was. The Jones is arguably the most under appreciated band to feature Dickie Hammond. I'm not sure if it just got lost in the shuffle and not enough people heard it, but whenever I read anything about the great albums that Dickie was a part of, I never heard this mentioned. It's a bit of a shame as aside from Leatherface, The Jones could be my favorite thing that Dickie ever did. Just give the opening track "Monotone" about forty-five seconds. With its searing guitar riff in the verse, the slowed down, hook filled chorus and impassioned vocals from Golly (also from HDQ like Dickie), you'd be hard pressed to find a more impressive song in Dickie's arsenal. But it's not the only one. The album is nearly perfect in execution with song after song of incredibly dynamic guitar work. It's kind of crazy to me that more people don't know and love this album. 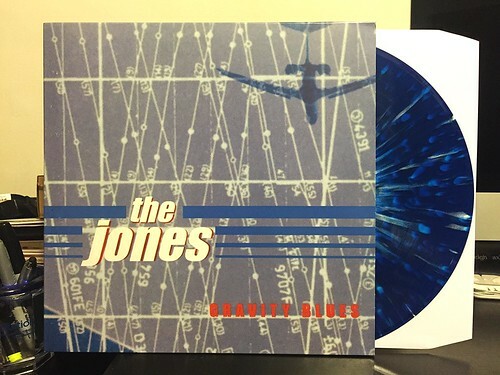 For this vinyl reissue the fine folks at Boss Tuneage have also tacked on two 7"s that preceded the Jones full length. The Stokoe 7" and Fatty Jones 7" both featured Dickie and Golly, but each had a different cast of characters supporting them on other instruments. Fidelity wise, the three Stokoe songs stand out a bit from the rest, but as far as song quality goes, they are every bit as good. Again, I couldn't be more excited to finally have these songs on vinyl. Maybe The Jones isn't quite as well known as Leatherface, HDQ or even Doctor Bison; but they should be. Every song on here is incredible and this is absolutely a record you should go out of your way to pick up if you don't already own it.